On the evening of 20 July 1969 I was on my very first airline flight – my first venture into space, as it were – and I recall looking out the window and up at the moon that night and thinking with wonder and satisfaction about Apollo 11, the first manned mission to the lunar surface. The Vietnam War was in full swing but I was too young to be personally affected, young and ignorant and, in the well-worn tradition of adolescence, too selfish. Ice hockey camp in Canada was far more important to me. But after my return from Toronto, because I lived within a few blocks of the Naval Hospital in Philadelphia, the realities of that gruesome unnecessary war began to be felt. I saw, as I jogged around the hospital’s perimeter, men in wheelchairs on the grounds, young men without limbs. By the time I would have reached draftable age the war would be over, at least for American troops; but for the Vietnamese and Cambodians and Laotians, whose countries were poisoned, ravaged and mercilessly bombed for years, the effects of the war would persist. During college as I grew into a greater social and political awareness about Vietnam and the string of traumatic political assassinations – jarring ruptures in what I imagined our country’s shared life to be – I took some measure of solace from the glowing magnificence of Apollo, the momentous achievement of the impossible, an incomparable feat undertaken ‘for all mankind’. Power, daring, knowledge, expertise, and even the freelance individual brilliance Americans prided themselves on and identified with – Neil Armstrong’s overriding the computer at the last minute to take the helm and land on the moon’s surface – they wove a kind of magical spell, a spell that said: “Forget the evils of this world and celebrate the good that we can do.” Never mind that the Command Module Columbia was named after a man who left a colonial legacy of slavery, theft and genocide, or that the Lunar Module, the craft that carried Armstrong and Aldrin to the surface, was called “The Eagle,” after the symbolic American bird of prey. Many years later by a path too circuitous and strange to describe here, I found myself playing the character of Macbeth. There is nothing like acting a role in Shakespeare to touch and apprehend the profundity of his words. Unlike Hamlet, which I had read about a hundred times over the years, Macbeth was a play I had kept a considered distance from, preferring to see or read it infrequently, perhaps because it was too dark, too bloody or too bleak – until I decided finally to take it on. It is a curiously brilliant work. The plot is simple and does not generate a suspenseful mystery: we know who does the deed from the beginning of Act 2, and afterwards the play becomes a study in further murder and unraveling. The real mystery, however, is how the good, brave and loyal Macbeth we see at the very beginning of the play, for so he is before he meets the witches, can become a murderous traitor. As Duncan says before his own demise, “There’s no art to find the mind’s construction in the face.” And indeed, the piercing revelation at the core of Shakespeare’s greatest tragedy is just this: appearances are never to be trusted. 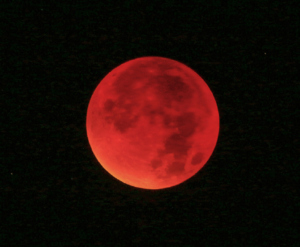 For one reason or other I had chosen to use the image of a large red moon as the backdrop to the scene where Macbeth and his wife plot to kill the rightful king of Scotland. In the wake of my experience with Macbeth, contemplating as I did the hypocritical and terrifying landscape of current-day politics and pondering the seemingly endless examples of State duplicity – 9/11, Iraq, Afghanistan, Libya, Syria, the erosion of the Bill of Rights in the name of an endless ‘war on terror’ – my mind went back to our misbegotten moon. Could it be, I wondered to myself, that this saving grace of the Apollo missions, that this too could not be taken at face value, this shining example of the possibility of exceptional good? I myself had discovered nothing new: the hard work had already been done by others to expose what I now would bet my life on was a supremely devious deception. My contribution is really to serve as an example of what happens when a reasonably thoughtful person thinks. I do not believe the full significance of the moon missions has yet to be appreciated. The psychological impact has been immeasurable. Named after the Greek god of light and poetry, the healer and protector from evil, they have mesmerized the world and persuaded us of the mighty benevolence of the country that conquered our nearest heavenly body. Since Apollo 17 was reputed to have flown to the moon in 1972 there have been no further manned landings. None. Nobody has gone back. And for good reason: it is not yet possible now, and it was certainly not possible then. On the 50th anniversary of that “giant leap for mankind” this coming July 20, 2019, let’s see things for what they are and were: the greatest propaganda stunt of our age. It’s high time we opened our eyes. Anticopyright: Editorials and articles originated on TMS may be freely reprinted, disseminated, translated and used as background material, provided an acknowledgement and link to the source, TMS: Our Misbegotten Moon, is included. Thank you. Emanuel Garcia’s eloquence is so rare, and his ability to weave the personal with the artistic and the factual in an essay that floats like a limpid stream to a startling and true conclusion about the great deception of the moon “landing” is fantastic. No doubt his conclusion might seem chimerical to many readers, so he kindly suggests a homework assignment that seems most appropriate as a new school year commences and when truth-seeking should begin for all ages in these misbegotten times. Thanks Manny. It’s certainly a consolation that someone else and clearly a highly intelligent someone, also sees that we live in a world of mass deception. Wonderfully and bravely done. Homework a must, but only in the true spirit of openess and inquiry. Let’s hope that spirit isn’t yet entirely dead in the 21st century. It is clearly alive in the author. I read Emanuel’s first journalistic excursion to the moon a couple of months ago. As always, his linguistic skills entrance, while his factual panache wakens one to the “terrible beauty” of this world–the harsh realities behind the intriguing facades. Traveling with him thru the winding corridors of Shakespeare and Macbeth, we note his contribution with a sky full of shining lights of gratitude.